When written in Chinese the word 'crisis' is composed of two characters one represents danger and the other represents opportunity. The only reason to give a speech is to change the world. If you make peaceful revolution impossible you make violent revolution inevitable. No matter how big the lie; repeat it often enough and the masses will regard it as the truth. We choose to go to the moon in this decade and do the other things. Not because they are easy, but because they are hard. We are under exercised as a nation. We look instead of play. We ride instead of walk. Our existence deprives us of the minimum of physical activity essential for healthy living. New Updates! (4/20/2019) We've been working really hard on completing our membership system so you can submit quotes and keep track of them. Once this is complete in the coming weeks there will be a lot more quotes by John F Kennedy and other authors. 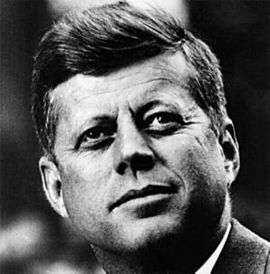 We've also changed the sorting on the site so you now see the latest John F Kennedy quotes first. Our goal is to have the best John F Kennedy quotes on the web!